Nearly all talk about the brain focuses on the cortex as the organ of consciousness and intelligence. The mind is likewise praised for logic and reason. Both are conceived as separate entities set apart from the body and, above all, from inner awareness. But this view, while common, is wrong. The “association of intelligence with thinking and reasoning isn’t fact; it is a cultural belief,” says Professor Guy Claxton at the University of Winchester. Free of jargon, he illuminates for readers what specialists in neuroscience and philosophy have understood for decades: that the physical body constitutes the core of our intelligence. According to this view many of our decisions and actions that we think of as brain-driven are in fact instigated in our somatic selves without the need for any involvement of the brain. What the experts above call embodied perception sees the brain not as a passive antenna sitting there waiting for things to impinge on it, but as an active explorer that seeks out the particular items and events that interest it. The brain cannot take in all of the enormous energy flux that bombards it every second, and so paradoxically it has to be a strong filter, too. This contradiction is what lies behind the selective, and unique, point of view with which each individual is endowed. A GoogleMaps car, for example, indiscriminately records everything as it drives down the street, whereas two people walking the same street notice entirely different things with respect to shops, restaurants, and passersby. People have different perspectives. They’re inherently curious about different things. They assign different values to what they encounter. 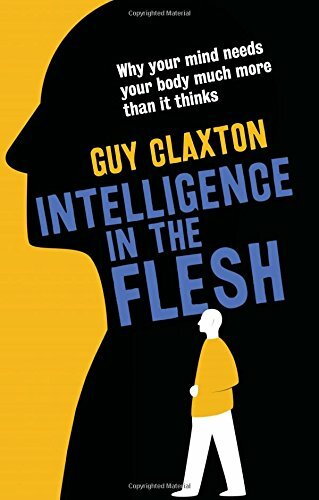 Repeatedly, Claxton reminds us that we do not merely “have bodies; we are bodies.” That is, if your body were different you couldn’t help but literally be a different person. Embodied brains don’t passively soak up knowledge the way The Matrix depicts. In order to learn they must actively explore, as the famous “gondola kitten” first demonstrated. In that classic experiment one littermate was free to explore while another kitten hung passively suspended in a contraption that moved in parallel with the self-directed kitten. The passive kitten learned nothing and remained as blind as it was at birth despite “seeing” everything the other kitten had. Claxton elaborates a point he made earlier in Hare Brain, Tortoise Mind: Why Intelligence Increases When You Think Less, namely that “We are fundamentally built for action, not thinking or understanding.” Given this, sitting passively in front of screens for hours—especially by young people whose brains are not fully developed until age 25—can potentially stunt intellectual growth. Screens and digital distractions of all kinds make it easy to ignore the physical, compounding the already widespread decline of physical activity in society. We neglect our bodies because we underestimate their intelligence, Claxton says. An emphasis on rational thinking has resulted in too much screen time, the withering of manual craftsmanship, and the elevation of white-collar over blue-collar work. Young people who spend hours each day in front of a screen, who prefer texting instead of face-to-face social engaement do not build up a sizeable database of motor experience from which they can anticipate and prime their motor system for action. A lack of social resonance and inability to anticipate go hand in hand. Given that, it is any wonder teachers lament that the current crop is deficient in precisely these social skills compared to earlier students. If young people have less and less experience of what to expect, then they become increasingly blind to what they are feeling—the meta-cognitive state of self-awareness. Embodied perception and metaphoric thinking (which is also rooted in our physical interaction with the world) support one another. They help us navigate in a complex social world. A dimishment of self awareness and social resonance will impair one’s ability to solve problems—especially problems for which there are no obvious answers, or perhaps no answers at all in the face of having to act and thus come to some decision.